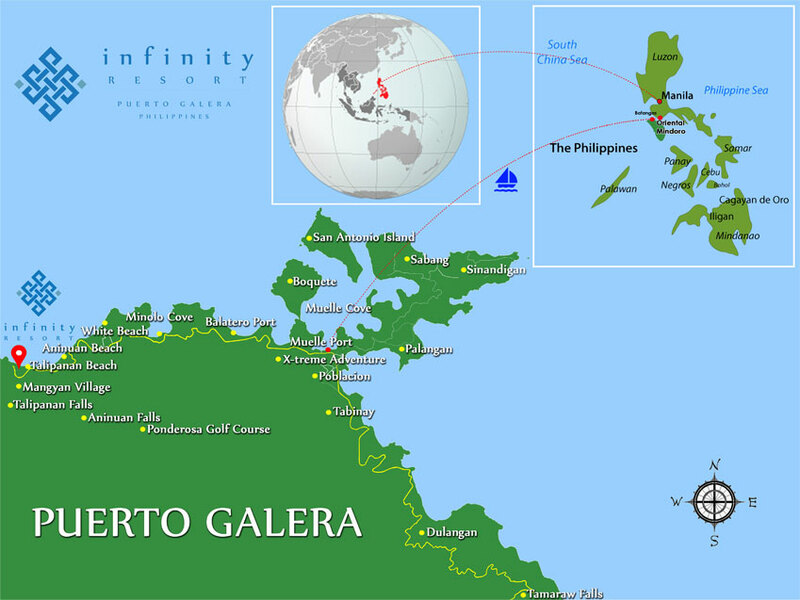 Puerto Galera, one of the oldest settlements of the religious missionaries in the Philippines, was founded by the Spanish in 1574 as the provincial capital of Mindoro Island. However, the history of the locale goes way back into the metal age and probably beyond. Artifacts found at ancient burial sites at Lalaguna and Minolo suggest that a thriving culture existed here for many millennia before the Spanish arrived. Occasional Chinese records from as far back as the 10th century suggest frequent trading with the indigenous Mangyan people: exchanging glazed porcelains for gold, jade, corals, shells, birds, rattan and other forest products that were abundant on the island. The Mangyans still live in the surrounding forested hills and can occasionally be seen in the town selling woven abaca items and gold recovered from the rivers and streams that cascade down the towering mountains behind. The town lost its status as the seat of government for Mindoro in 1837; Calapan took over the role, as the focus of agriculture and commerce shifted East along the coastal plains. [Puerto Galera was briefly the provincial capital again, in 1902 and 1903, while the Philippines was under American rule] More recently, on December 26, 1973, PD (Presidential Decree) 354 was issued by then President Ferdinand E. Marcos making Puerto Galera a reservation area under the UNESCO Man and Biosphere Programme. Puerto Galera has beautiful beaches- Long beach, white sand beach, Coral Garden, Monkey Beach, Haligi Beach among others. Beach hopping is one way to experience all these in a day… Many deserted beaches are found on Mindoro. Just tell us when and where you want to go, and we’ll take you there by boat. Talipanan Beach is a nice alternative to White Beach during peak season, when the waterfront gets a little crowded. A quick ride by jeepney will carry you from White Beach to Talipanan, where tourists enjoy an easy going atmosphere. There is ample space for swimming here. Tamaraw Falls is a series of cascades culminating in a 460-foot plunge into a nice manmade pool where children can swim. There is also a challenging hiking trail that tracks along the river as it descends through the mountain. A modest entrance fee allows access to a picturesque picnic area, making Tamaraw Falls an ideal daytrip destination for those staying in Puerto Galera. Travelling onwards a few more miles along the road to Calapan you’ll find a pleasant sand beach as well as the heritage fishing village of Villa Flor. Aside from scaling mountains, enjoying panoramic views and relaxing near waterfalls, there is also opportunity to view wildlife while trekking. The most exciting specimen is the endangered tamaraw, an elusive buffalo that roams freely throughout the mountains that back Puerto Galera. For the most panoramic views of Puerto Galera you simply must not miss a trip up the mountains to the Ponderosa Golf Club where, with very modest green-fees, you can play one of the world’s most dramatic 9-hole golf courses guaranteed to challenge your short game. If you do not want to bring your own golf clubs then you can rent suitable sets from the Ponderosa Golf Club. And if you have friends who don’t play golf then still take them along for there is plenty to see and do for no-players.